On 17 June, 1881, Fawcett Plumb (1834-1919), a businessman, politician and prolific inventor from Streator, Illinois, (see biography of Fawcett Plumb), applied for a patent for keyboard adding machine. The patent (see US patent 256591) was granted in April, 1882. Besides the above-mentioned patent, Plumb was a holder of several other patents (at least 6) for various machines, like device for fastening roof tiles, kiln for burning bricks, ditching machines, twin cylinder single acting engine, etc. 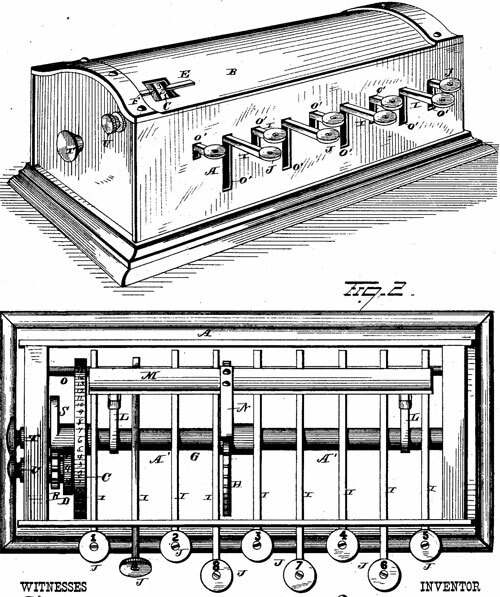 After the three first key-operated calculating machines in the world, invented in Europe (see machines of James White, Luigi Torchi and Jean-Baptiste Schwilgué), there are a number of patents issued in the United States on machines of this class, starting with devices of Parmelee from 1850, Hill from 1857 and Winter from 1859. All of these machines varied in construction, but not in principle. Some were really operative and others inoperative, but all lacked what may be termed useful capacity. Such machines, of course, never became popular because of their limited capacity, which required many extra movements and caused mental strain without offering an increase in speed of calculation as compared with expert mental calculation. Let's examine the adding machine of Fawcett Plumb, using the patent drawing (see the patent drawing below). The machine is a simple column adder (for adding up columns of figures). The principle upon which the device is constructed consists in the revolution of a disk peripherally encircled by a series of numbers running from 0 to 99 through arcs of circles embracing from one to nine numbers by means of nine keys transmitting motion through a system of suitably-arranged levers. Marked with A is a case, adapted to inclose the working parts of the instrument. It is provided with a removable convex cover, B, which is perforated to expose a small section of the peripheries of the units and tens wheel C and the hundreds-wheel D. Pointers E and F, attached to the said cover, designate the numbers on the wheels C and D respectively. The units and tens wheel C is mounted on a shaft, G, which longitudinally traverses the case A, being journaled in each end thereof. The hundreds wheel D, encircled by a series of figures running from 1 to 10, is mounted on a short shaft, Q, journaled in one end of the case. The said shaft Q also supports a cog-wheel, R, provided with ten cog-teeth, with which a cam, S, rigidly secured to the shaft G, is adapted to be engaged to move the hundreds-wheel one-tenth of a revolution to every complete revolution of the units and tens wheel (thus performing tens carry). Ten revolutions of the units and tens wheel are required in the regular operation of the instrument through the keys to effect one complete revolution of the hundreds-wheel. However, to facilitate the operation of setting the instrument, the shaft G is provided with a thumb-nut, T, by means of which the wheel C can be revolved independently of the system of levers and keys, and the short shaft Q is provided with a thumb-nut, U, whereby the hundreds-wheel may be revolved independently of the cog-wheel R and cam S.